An ancient hunting art perfected over thousands of years, falconry is a majestic sport that requires talent, intuition and passion. Over the years it has practically died out, but in countries such as the UAE it still reigns supreme, with many paying thousands and spending many hours honing their craft and training truly exceptional birds. Staff writer Hannah Stevenson explores the region’s continued love of bird of prey and why they remain a key part of many people’s lives. Falconry is an ancient practice whose regal connotations go back centuries. Originally used for hunting, falcons were also a status symbol among the wealthy and influential. Today, thanks to the cost and time constraints of keeping these birds, as well as the licences required, falconry is not as common, and birds no longer hold the status they once did. Despite the vast amounts of money, time and expertise needed to successfully keep, breed and hunt with falcons and other birds of prey, they remain incredibly popular in the Middle East, where many royals, wealthy individuals and even ordinary members of the public continue to enjoy flying falcons. A few years ago a Reddit post showcased the true extent of the Middle East’s love affair with falconry, when a user shared a picture of a plane filled with hawks, allegedly owned by a member of the Saudi Arabian royal family. Although the ownership of the birds is not verified, they symbolise the Middle East’s on-going passion for the sport. At the end of 2018 Gulf Today reported a 30% year-on-year increase in participation in the Sharjah Falconers Club Championship – (Telwah). Many may not be surprised by the Middle East’s continued fascination with falconry, particularly since many animals are still used as status symbols in the region. For example, camel racing remains a popular sport and many racehorses and pedigree dogs are owned by MEA residents who wish to use these animals as a symbol of their wealth and power. 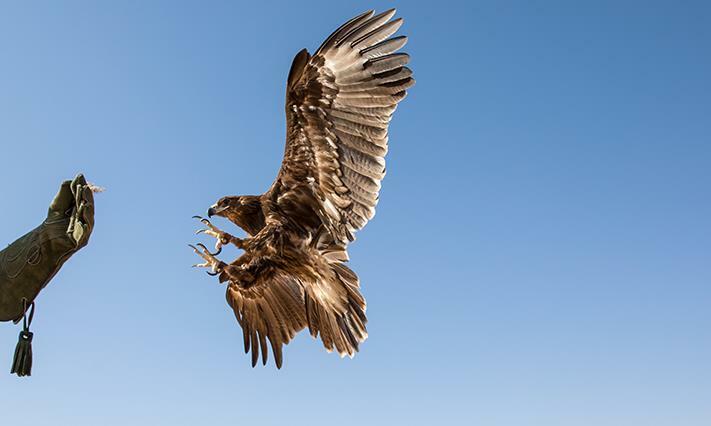 Gary Timbrell, CEO of the International Association for Falconry and Conservation of Birds of Prey explores how falconry originally came to the Middle East and how far it has come over the years. “Western falconry almost died out. In Europe from the Middle Ages it gradually became the pastime of the rich, who then excluded the ordinary people. Then guns were invented that were a much more efficient method of getting food. By the 19th century, European falconry was hanging on by a thread. It struggled through the first half of the 20th century and then, in the ‘60s and ‘70s was hit with a sudden plunge in the peregrine falcon population. “In 1976 the late Sheikh Zayed brought together falconers and conservationists from all over the world to discuss two things: why the peregrine was in decline and how falconry and its traditional values could be revived. He was successful in both his visions: the falconers and conservationists worked together to discover the cause for the peregrine’s sudden demise (agricultural pesticides like DDT) and to restore the world population by captive breeding and release. Now there are more peregrine falcons than ever before in the history of mankind. “His Highness’ vision to revive falconry and its values also worked: first of all, he encouraged his own people to continue practicing ancestral values, while enjoying the wealth that modernity brought to his nation. The fact that falconry had never quite sunk in the Arab countries to the low level it had in Europe, helped a lot. Thanks to the sport’s popularity in the region, it hosts many exhibitions and events, where international falconry fans gather to share their passion. Gary explains the excitement these events evoke. It is this shared passion and openness that is perhaps what sets the Middle East, in particular countries such as Qatar and the UAE, apart in terms of falconry. Whereas in Europe and America the sport is confined to a limited number of dedicated practitioners, in the Middle East there is a collective focus on falconry as a hobby, and it is this that has led the region to become one of the largest markets for falconry in the world. This passion for falconry offers businesses an insight into the mindset of the region, with its focus on prestige and heritage, and also provides many exciting opportunities for companies in this sector and many others to capitalise on the region’s passion for birds of prey.